When I made my Gentleman’s Game lineup last night, I put my heart and soul into it. As I looked at the players I would go to battle with and hit ‘submit lineup’, I thought I had an excellent shot to take this week’s top prize down. After all, what could go wrong with Felix Hernandez and Madison Bumgarner as your two horses and a bunch of value hitters. What ensued was the grenade blew up in my hand. Felix collected one out and gave up eight first-inning runs in Houston for an ERA of 216.0 for the game. My Gentleman’s Game lineup was in negative points until about 10:00 eastern time when I started to get sleepy and knew I was going to finish last once again. I was embarrassed by the King. t3bird04 took it down by using the top-scoring pitcher of the night, David Price. 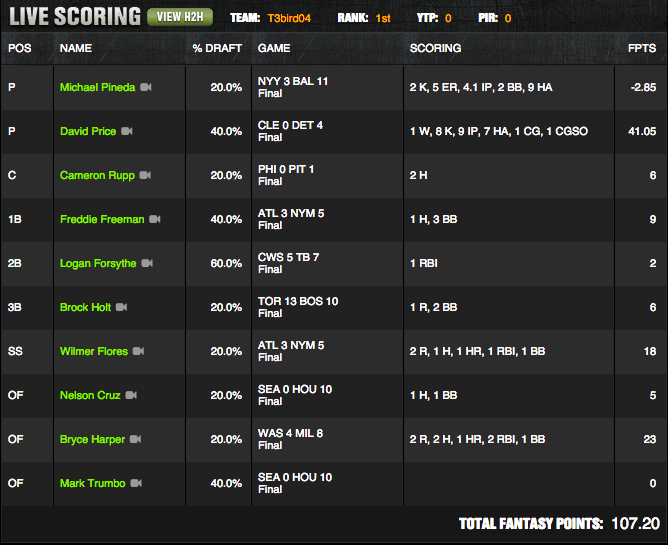 Getting 23 points from Bryce Harper and 18 from crafty play Wilmer Flores were his other big scores of the night. The bird was the word, and the only man to crack 100, in route to taking sole possession of first place in the standings. 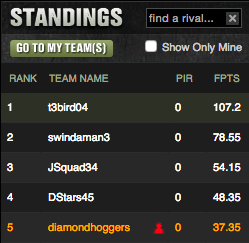 The bottom three in this game were three of the lowest DFS Draftkings scores you’ll see. It is sad that the inventor of the Gentleman’s Game is getting embarrassed in his own quarters. Will he be able to right the ship and get back in things to have a say? Will aces be blown up again to begin next weekend? Which unlikely heroes will be crowned in this Pantheon of champions? You must turn in next week to find out.